In a small saucepan over medium heat, bring the first five ingredients to a boil; boil, uncovered, for 1 minute. Cool for 10 minutes; set aside 1/4 cup for basting. Flatten chicken to 1/2-in. thickness. Pour remaining marinade into a large resealable plastic bag; add chicken. Seal bag and turn to coat; refrigerate for at least 2 hours. Drain and discard marinade from chicken. Grill chicken, covered, over medium heat or broil 4 in. from heat for 5-6 minutes on each side or until no longer pink, basting occasionally with reserved marinade. In a small bowl, combine the blue cheese, buttermilk, mayonnaise, Parmesan cheese, chives, lemon juice, vinegar, garlic and pepper. 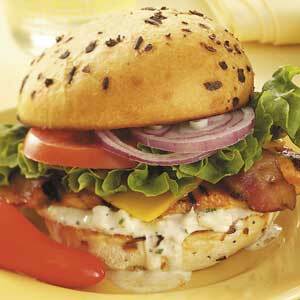 Spread over roll bottoms; top with the chicken, bacon, cheese, lettuce, tomato and onion. Replace roll tops. Set the seasoning packet from rice mix aside. In a saucepan, melt 1 tablespoon butter. 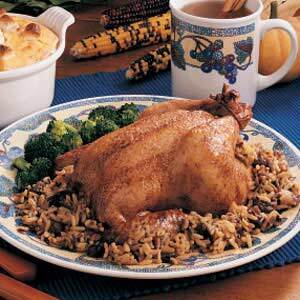 Add rice and pecans; cook and stir over low heat for 10 minutes or until rice is golden brown. Stir in the orange juice, water, raisins and contents of seasoning packet; bring to a boil over medium heat. 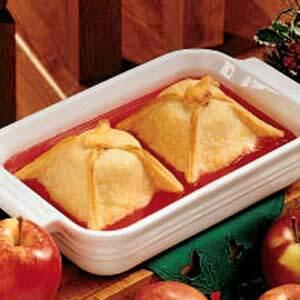 Reduce heat; cover and simmer for 25 minutes or until liquid is absorbed. Spoon about 1/2 cup rice mixture into each hen; refrigerate remaining rice mixture. Tie legs of each hen together; turn wing tips under backs. Place on a greased rack in a roasting pan. Melt remaining butter; brush over hens. Sprinkle with salt and pepper. Bake at 350° for 1 to 1-1/4 hours or until a thermometer reads 165° when inserted in center of stuffing and thigh reaches at least 170°. Baste occasionally with pan drippings. Heat reserved rice mixture; serve with hens. In a small saucepan, combine the cornstarch, ginger, soy sauce and water until smooth. Stir in the marmalade, lime juice, oil and garlic until blended. Bring to a boil; cook and stir mixture for 1-2 minutes or until thickened. 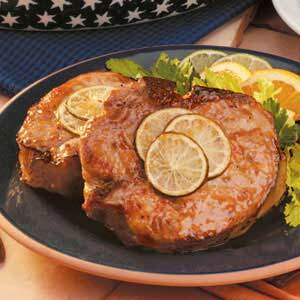 Place the pork chops in a greased 8-in. square baking dish. Spoon glaze over pork, turn to coat. Top with the lime slices. Bake, uncovered, at 400° for 30-40 minutes or until pork juices run clear. In a bowl, combine flour and salt. Cut in shortening until mixture resembles coarse crumbs. With a fork, stir in water until dough forms a ball. Roll out on a floured surface to a 14-in. x 7-in. rectangle; cut pastry in half. Place dumplings in an ungreased 9-in. x 5-in. loaf pan or a shallow 1-1/2-qt. baking dish. Brush with cream. In a small saucepan, combine the sugar, red-hots, cornstarch, water and butter. Bring to a boil over medium-low heat, stirring frequently; boil for 2 minutes. Pour between dumplings. 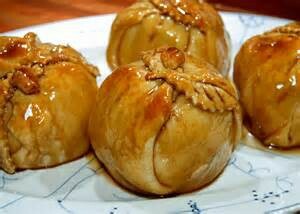 Bake at 400° for 35-45 minutes or until pastry is golden brown and apples are tender. Serve warm with cream if desired. Combine popped popcorn and peanuts in a metal bowl or on a cookie sheet and place in preheated oven. Combine all remaining ingredients in a saucepan. Stirring over medium heat, bring the mixture to a boil. Using a cooking thermometer, bring the mixture to the hard-ball stage (260-275 degrees). This will take 20-25 minutes. Remove the popcorn and peanuts from the oven and, working very quickly, pour the caramel mixture in a fine stream over them. Then place them back into the oven for 15 minutes. Mix well every five minutes, so that all of the popcorn is coated. 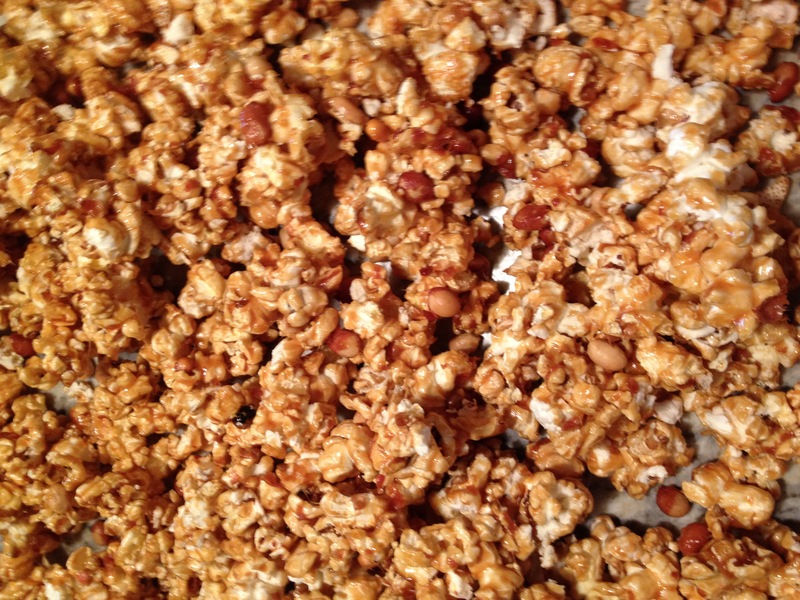 Remove from oven and pour popcorn out onto wax paper and allow to cool. Break up the chunks. Cool and store in a covered container to preserve freshness. Enjoy! In medium bowl, mix milk and yeast. Add butter, sugar, and salt. Stir. Add 1 cup of bread flour and mix well. Add in enough remaining bread flour to make a dough that follows the spoon around the bowl. Turn dough out onto lightly floured surface and knead for 10 minutes, adding more flour as needed until the dough is firm and smooth to the touch. Place dough in medium greased bowl. Turn dough over in bowl so that the top is also lightly greased. Cover with clean cloth and let rise in warm, draft-free place for 1 hour. Punch down. Turn dough out onto lightly floured board and knead out bubbles for 5 minutes. Divide dough into 4 equal pieces. Set 2 pieces aside. Roll out the remaining 2 pieces of dough between your hands, making 2 ropes, about 10-inches long. Set dough ropes side-by-side on floured board or table and pinch the top ends together. Twist dough ropes around each other and pinch bottom ends together. Set twisted roll on greased baking sheet and repeat steps for the remaining 2 pieces of dough. Cover rolls with kitchen towel and let rise in a warm, draft-free place for 30 minutes or until doubled in bulk. Bake rolls at 350 degrees F for 30 minutes or until roll tops are golden brown and the rolls sound hollow when the tops are tapped. Remove rolls from baking sheet and let cool on rack. In a large bowl, add water and yeast. Stir until the yeast is dissolved and then let stand for about 2 minutes. Next, add the milk, honey, salt, and coconut oil. Stir until the honey and salt is dissolved. The salt does not kill the yeast. It “retards” or slows down the growth of yeast and brings out the flavor in the bread. Add wheat bran, whole wheat flour, rolled oats, and mix. Mix in two cups of bread or all-purpose flour. Add in more white flour until the dough becomes too difficult to mix with a spoon. Turn it out onto a floured surface and begin kneading the dough. If the dough still feels sticky, sprinkle about 2 tablespoons of flour onto the dough and knead it in. Continue to add flour, as needed, until the dough is smooth and firm. Grease a large bowl with butter or shortening. Put the dough into the bowl and then flip the dough over so that the dough top is also lightly greased. Cover the bowl with a clean kitchen towel and set to rise in a warm, draft free area for 45 minutes or until doubled in size. After the dough is finished with its first rise, punch down the dough inside the bowl and turn out onto a lightly floured surface. Knead the dough until all the bubbles are out, about 5 minutes. Shape the dough into a single loaf. Grease a 9×5 bread pan with butter or shortening. Lightly coat the inside of the pan with cornmeal. This is to help the bread release from the pan after being baked. If you don’t have cornmeal on hand, simply grease the pan and skip the cornmeal. Place the shaped loaf into the pan, cover with the clean kitchen cloth, and let rise a second time in a warm, draft free area for 45 minutes or until doubled. Bake the loaf at 350 degrees F for 50 minutes or until the top is golden brown and the bread sounds hollow when you tap on the top. Remove from oven and turn out the loaf onto a rack. Allow it to cool completely before storing or freezing. 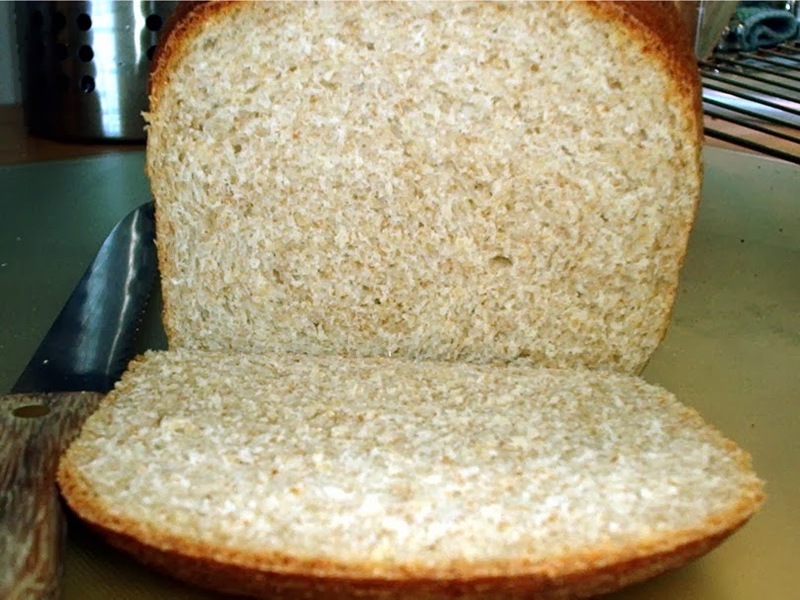 You can easily freeze bread for sandwiches. First allow the bread to cool completely. Slice the loaf as you would for sandwiches. Place all the slices in the bag, close it, and set it in the freezer. To use, take out the slices you need to make sandwiches and allow them to thaw on the kitchen counter or lightly toast the slices. Put the slices at once into a bowl of cold water and let stand for at least one hour. Ice water is best, but you can set the whole bowl in the refrigerator if you wish. Shaking them in a towel to dry. Fry in hot oil at 375 degrees F. until a light golden brown. Don’t try frying too many at once, better to put one layer on the frying basket. Drain on paper towels or any kind of plain crumpled absorbent paper. Combine dry ingredients in a bowl, then add milk. Mix, but don’t over mix. Cook on an oiled (or sprayed) pan, on low-medium, flipping each pancake once. 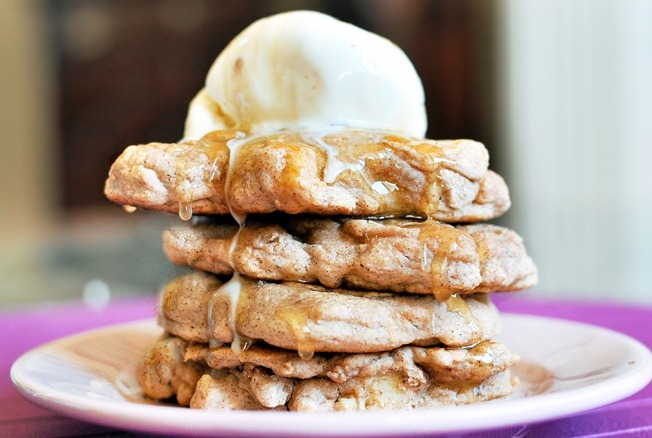 Top with Whipped Cream or Ice Cream. Preheat oven to 350 degrees. Combine all ingredients in food processor, and pulse until crumbly. Add cold water, a tablespoon at a time, until dough comes together. Form into ball, wrap in plastic wrap, and chill in the freezer for at least 30 minutes. Place dough between two pieces of plastic wrap or parchment paper, and roll out to ⅛ inch thickness. Transfer to parchment-lined baking sheet, and, using pizza cutter or sharp knife, cut into 1 inch squares. Sprinkle with kosher salt and bake for 25 minutes. 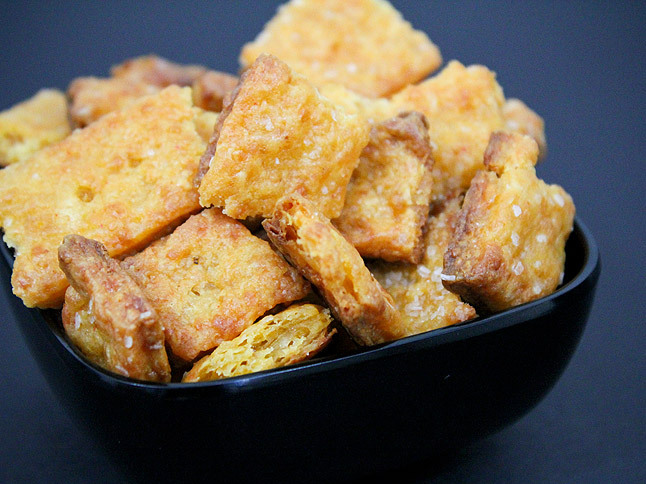 Test for crispiness; crackers may take a few minutes more to finish crisping. 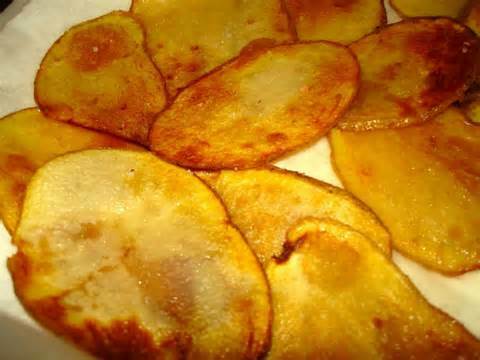 Remove from oven when crisp and just starting to brown. Let cool and serve.